Please note that this is not investment advice. 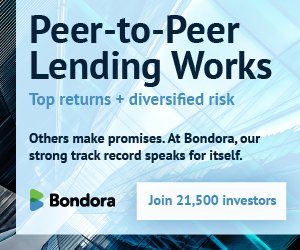 So, as announced last month, I will be trying out the peer to peer lending platform Bitbond and will be writing about my experiences on this blog. The positives, the negatives and the room for improvement will all be discussed here. 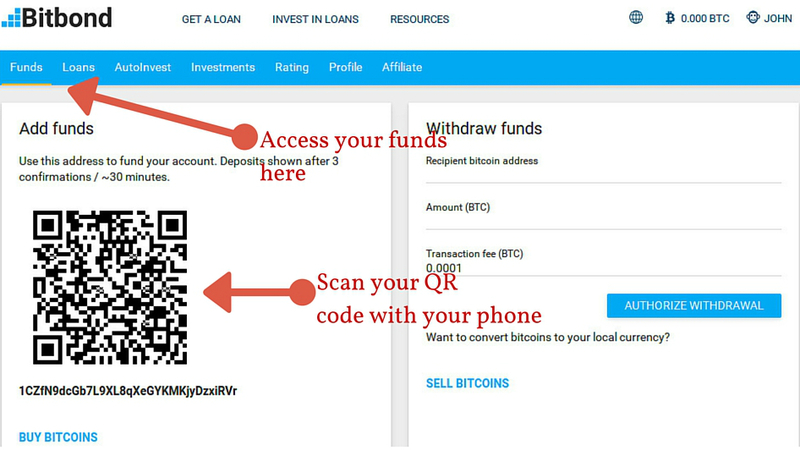 Initially I will only invest €100 (฿0.454 as of October 12th 2015) in handpicked p2p bitcoin loans, following up with another €100 every month. This will allow me to build up a respectably diversified portfolio, but still gives me the time I need to learn from my mistakes. I will tell you my investment strategy later on so you can follow developments and hopefully learn from the mistakes I make, as well as pitch in with your own investment strategy in the comments. All the great interest rates and dreadful defaults will be recorded on this blog. So let’s get started. Before we can invest, we need to get our hands on some of the digital currency. The ease of doing this depends on your location, although it is relatively simple to do anywhere in the world. I am currently based in Europe and luckily they (Bitbond) just rolled out their newest feature; allowing users with EU bank accounts to buy bitcoin on Bitbond itself, without the need to register with an exchange. I’ve included screenshots of my progress all along this post, so you can get a feel for Bitbond and see if p2p bitcoin investments might interest you. 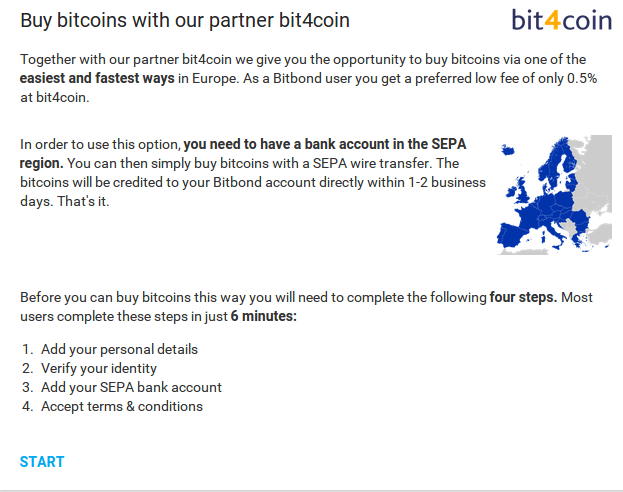 Below is the welcome page of the Bit4Coin integration which allows you to buy bitcoin on Bitbond if you are in Europe (including the UK). The process is pretty self-explanatory, I just had to type in the usual basic information about my personal and bank information. It’s worth touching on the second step, which is the identity verification part, as it actually doesn’t involve the uploading of any scanned documentation or such like. Instead it is a live video session with an english speaking security assistant who asked me to hold up my ID and input a tan number he sent to my phone. Interesting stuff. If you are not located in Europe (and I know a lot of you are in the US, Australia, New Zealand etc), you will need to find an exchange or marketplace that services your region. Below, I briefly outline the best way for you to get bitcoin quickly. I am by no means an expert here, but Bitbond have a guide, which helped me get an overview for the non-european readers. For most of you, Coinbase seems like the best option for acquiring your first bitcoin. I signed in and purchased some, in order to go through the experience, and can highly recommend them. The signup process is pretty simple, and the navigation afterwards is easy. If you have difficulties with signing up, check out the support documentation for detailed help. If Coinbase is not an option for you, have a look at Local Bitcoins. They service most areas in the world and tend to offer decent pricing from what I have read. I have not used the platform personally however, so let me know what you think in the comments below. Once you have bitcoins on your Coinbase or Local Bitcoins wallet, simply transfer them to your Bitbond account by scanning in your QR code, or entering your Bitbond wallet address in manually. Right, now that the basic stuff is out of the way, let’s get investing. What is my investment strategy on Bitbond? So first off, I think it’s really important to have an investment strategy. Blindly following my gut feeling has never worked for me, both on p2p lending platforms and in real life. Setting clear investment parameters obviously depends on the information available to you. In Bitbond’s case, the amount of data is quite impressive. Going to their statistics page, we can download a CSV file containing their entire p2p bitcoin loan history. Importing this into Google Sheets, we can manipulate the Data and see which investment strategy would have worked best in the past, giving us insights into what will work in the future. Despite the long list there is some important information missing in my opinion, such as the name, an image and a relevant email address, so I can contact the borrower before commiting any bitcoins. I understand that giving out email addresses can be a thorny matter so I don’t hold that against them. However, the name in particular, is usually an important factor in my p2p investments because I like to be able to do some background checks of my own on prospective investments. This would usually include, checking Facebook Groups for scam alerts related to this name, doing a google search and seeing what comes up, as well as checking them out on LinkedIn, to see their professional credentials for myself. Further, an image helps me, because over the years I have become better than most in identifying stock or stolen photos. Overly attractive people smiling into the camera, or low baseball caps and sunglasses tend to be reliable red flags in my opinion. Nevertheless, with this Data we can start to sculpt our ideal portfolio from scratch. In order to do so, we need to write out our motivations behind investing in the first place. For me, I would like to make high returns while investing in small business owners from around the world. 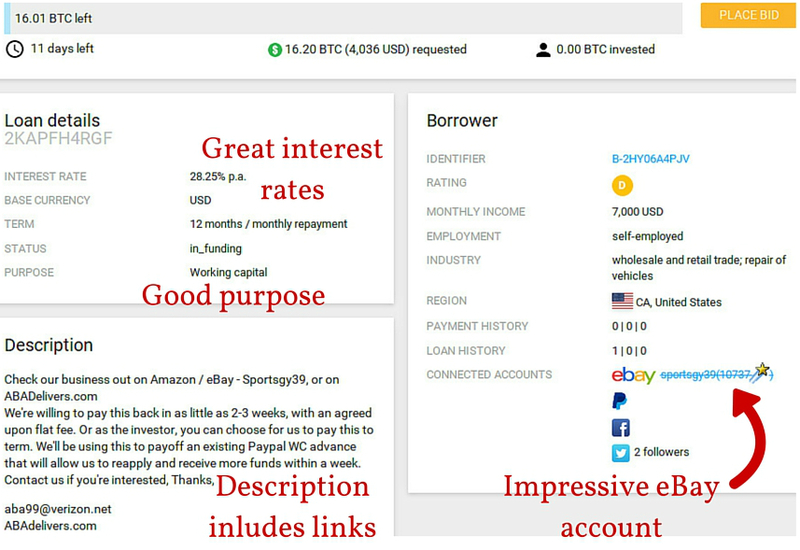 Thus, I will be looking for borrowers who have connected their eBay account, and have indicated “Working Capital” as the purpose of their p2p bitcoin loan. Borrowers with a Credit Rating ranging from B to E will be considered in order to insure high yields, despite the probably higher default rate. The loan and payment history also play important roles in my strategy, as borrowers with overdue loans are regarded as untrustworthy and will be ignored. Other factors I will be scrutinising include the Loan Description and the Industry in which the borrower is active. If I have little-to-no knowledge about the industry, or the Loan Description is sloppy or too short, I will not invest. Preferably, borrowers will already have repaid a loan on Bitbond, but I am flexible on this point. With the cornerstones of my lending strategy in place, I will insure diversity in most other factors across my investments. The location, interest rates, the denomination of the loan, employment, size and period of the loan, the number of twitter followers or Facebook friends a prospective borrower has, should vary across my investments in order to ensure maximum possible diversity in my portfolio. This is important, because sudden macroeconomic effects for example, can radically change an entire regions repayment rate. Thus, I protect myself by diversifying as much as possible around my basic investment principles. Now that we have our strategy in place, we can have a look at the p2p bitocin loan listings to start finding the best borrowers. The first borrower I checked out seemed a good fit already. As you can see from the screenshot, this listing falls in line very nicely with my investment principles, so I decided to place a bid of BTC0.15 or €32.72. To place a bid, all you have to do is press the orange button and enter a value of your choice. Be sure to have bitcoin exchange rate site open so you know exactly how much money you are investing in bitcoins. I picked these borrowers because they fit my investment strategy, I like their loan descriptions, and I believe their credentials. Their credit ratings vary, the highest being a B, and the lowest a D, as do their locations and social media connections. This is perfect for my goal of diversifying as much as possible, and hopefully reaping handsome rewards for it in the process. Finally, having a look at my “Investments” section, I can see my activity laid out in visual form, which is pretty sweet. Below the graphs, the repayment schedule is located which provides all the essential information in one go. What happens to my p2p bitcoin investments? Now that my first p2p bitcoin loan has been made we have to wait and see if the borrowers I lent to get enough funding to get paid out. This requires a minimum 60% of the request to be funded on the date of expiration. Every loan request is available for investment on Bitbond for 14 days, with mine having between 2 and 12 days remaining on their loan requests at time of writing (12/10/2015). That being said, should one of my investments not get the funding they need to receive the loan, the money I lent will be returned to me and I will reinvest it on the platform. This will be accompanied with a post on this blog of course to keep you up to date. That’s it for today. Let me know what you think of this series and Bitbond in the comments below. Any tips are hugely appreciated.